Explanation: Adrift in the rich star fields of the constellation Cygnus, this lovely, symmetric bubble nebula was only recently recognized and may not yet appear in astronomical catalogs. In fact, amateur astronomer Dave Jurasevich identified it as a nebula on July 6 in his images of the complex Cygnus region that included the Crescent Nebula (NGC 6888). He subsequently notified the International Astronomical Union. Only eleven days later the same object was independently identified by Mel Helm at Sierra Remote Observatories, imaged by Keith Quattrocchi and Helm, and also submitted to the IAU as a potentially unknown nebula. Their final composite image is seen here, including narrow-band image data that highlights the nebula's delicate outlines. 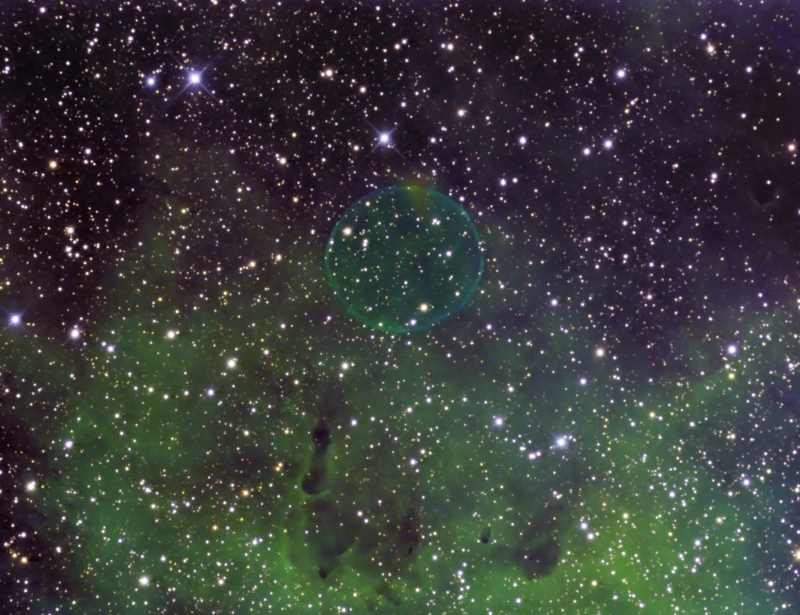 What is the newly recognized bubble nebula? Like the Crescent Nebula itself, this cosmic bubble could be blown by winds from a massive Wolf-Rayet star, or it could be a spherically-shaped planetary nebula, a final phase in the life of a sun-like star.